Content comprises of everything; from striking, eye-catching photos, to detailed, thought-provoking stories. The term refers to what your business is putting out there to connect with your target market. Everything that’s broadcasted via your social media, advertising methods, blog posts, website content, and anything in between, is, in fact, content. More and more recently, content marketing it a phrase that is on everyone’s lips. Ever since the seismic shift from link-building to earning, brought about by Google’s progressive algorithm updates, marketers have been exploring new and creative ways to create organic visibility. In a world where information is constantly being pushed at us from every direction, the only way to make your message stand out is with your own great content. Our team finds that this way of generalizing ‘content’ is pervasive, as if everything we create has managed to merge into a single, standardized, and consistent stream of stuff. Using the generalized term ‘content’ takes away the shine and unique individuality of each creative aspect, and the ability to create a lasting impression is ultimately replaced by an indifferent expectation for more and more of the same, well, stuff. As consumers become more discerning when it comes to advertising, it’s more vital than ever for businesses to build that genuine relationship with their target market if they want to succeed. Circling back to this idea that content has become increasingly boring; how do you stand out in a sea of indistinguishable stuff? First, we want to give the low down on content marketing as a strategy. 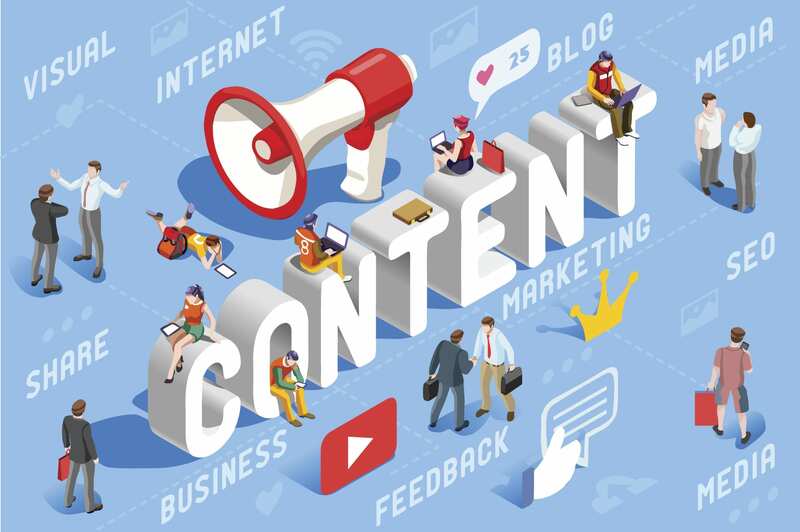 Content marketing is the strategic use of storytelling to ultimately connect with a consumer so that your business has a change to show it’s winning personality and desirable attributes in the hopes of sparking a connection and eventually securing that consumer’s devotion. To be clear however, content marketing is not a cut-and-dry formula. There is no singular format, platform, subject matter, or tone that can be universally prescribed for success. What we can tell you is, you need a super solid concept, message, and distribution plan. We’re here to help you figure those three things out. When developing a concept for your content marketing strategy, the most important thing to remember is that you should keep coming back to the question “How does this benefit the consumer?” Your content needs to connect with your target audience by somehow showing the consumer how your product or service has true value for them. In addition, make sure your campaign remains relevant. Your marketing campaign must remain relevant in terms of information, messaging, appeal, and even distribution channel. Know your target audience and identify the best way in which to reach them. Maybe it’s social media, or even print ads. Whatever the case may be, stay relevant to the consumer. Lastly, don’t be afraid to take the next step. Keep up with trends, or go beyond what is comfortable. We aren’t saying that you should find a way to be so different that you cannot successfully market your business, but don’t be afraid to think outside-the-box. After creating a concept for your marketing campaign, you need to focus on the messaging. Important aspects to consider when it comes to your messaging are subject matter, tone, as well as style and aesthetic of your creative. It’s crucial that your message articulates key values as well as the personality of your brand. And as we mentioned, keep your messaging relevant and engaging in terms of the demographics of your target market. After all of the other stuff is out of the way, you need to set up a solid distribution plan. Don’t be afraid to tap your connections. Know some great influencers? See if they might be willing to share or promote your content. When setting up your editorial calendar, make sure to recognize other organization’s content that is relevant to your messaging. Sharing their content or mentioning other organizations in your messaging just might inspire them to do the same for you. Also, make sure you are sharing your content through every digital distribution channel you have. Social media, email marketing, links on your website, even your blogs. You can also leverage social ads to pinpoint perfect targets for your campaign. Other digital advertising tactics could serve as additional successful tools to incorporate. Ultimately, your audience’s time is rapidly becoming the most sought-after commodity. As the content competition heats up, the opportunities in which to develop a lasting connection are becoming less frequent. To combat this, you need to turn towards crafting experiences that will drive excitement across your owned and earned channels. Don’t know where to start? Partner with Liquified Creative and together we can up your brand’s content game by creating compelling stories, relatable moments, and unforgettable creative that wins the hearts and minds of your audience…and some design awards too.